Doral's flagship model, the 45 Alegria is a state-of-the-art sport yacht. Built on a modified deep-V hull with nearly 14 feet of beam, the Alegria is a roomy boat on deck with several innovative features. The cockpit's curvy seating plan differs from most yacht in her class, and the center windshield panel retracts electrically for easy bow access. Below, the Alegria's spacious two-stateroom, two-head interior is a sophisticate blend of lacquered cherry cabinets. Ultraleather seating and premium hardware and appliances. A fully furnished galley is to port in the salon, opposite a six-person curved leather sofa (note the seven-foot headroom. A fiberglass hardtop was standard and a hydraulic swim platform (optional) can stow a dingy or watercraft. The 480hp Volvo inboards tops out at close to 30 knots. 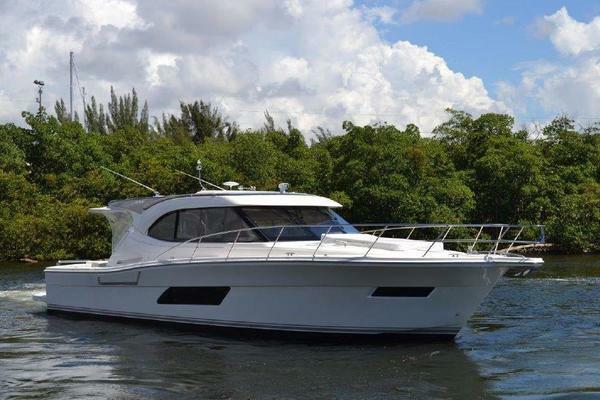 West Florida Yachts would love to guide you through a personal showing of this 45' Doral Alegria 2005. This yacht for sale is located in Huntington Beach, California and priced at $230,000. For a showing please contact us by filling out the form on this page and we will get back to you shortly!